This monster appears in the artworks of Lightsworn Judgment, Michael, the Arch-Lightsworn, and Twilight Twin Dragons. This monster has a Dark counterpart, Punishment Dragon, and a Synchro/retrained counterpart, Judgment, the Splendid Celestial Dragon. Realm of Light can be seen in the background of this card's artwork. It is partially destroyed, so it is likely after the effects of Light of Destruction, or possibly it was the destructive force of this card's own effect. This monster resembles the Luck Dragon, Falkor, from The Neverending Story. This monster also resembles a hybrid between a European gryphon and a Chinese dragon. This monster's inclusion in Turbo Pack: Booster One was the first instance a card was printed in the TCG as an Ultimate Rare without an Ultra Rare, Super Rare or Rare counterpart and the first to have a Secret Rare counterpart that isn't a tin promo. This monster's effect may refer to the prophecy of Judgment Day. In said prophecy, the world is destroyed by God, while in the case of Duel Monsters, Judgment Dragon, destroys all cards on the field except for itself. The presence of the word, Judgment, in this card's name further reinforces this connection. "Prime Material Dragon" cannot be chained to "Judgment Dragon"s effect which sends cards from the deck to the Graveyard (even though "Judgment Dragon"s effect is being activated, and "Judgment Dragon" has an effect which destroys monsters on the field). : When a monster with an "effect to destroy a monster(s) on the field" activates an effect which does something other than destroy, can you activate "Prime Material Dragon"? "Obelisk the Tormentor" can be destroyed by effects that do not target, such as "Judgment Dragon", "Lightning Vortex", "Mirror Force", etc. : Can a face-up "Obelisk the Tormentor" be destroyed by effects that do not target like "Lightning Vortex"? If "Mermaid Archer" and the equipped monster would be destroyed simultaneously by "Demise, King of Armageddon"/"Judgment Dragon"/"Final Destiny"/etc, then you cannot apply the effect of "Mermaid Archer" and destroy the equipped monster instead. : When "Mermaid Archer" and the equipped card would be destroyed simultaneously, can the equipped card be destroyed as a substitute? 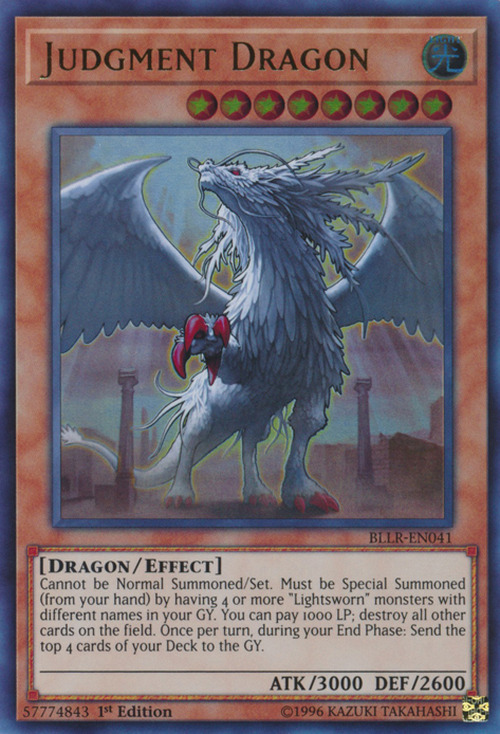 For the effect of "Dark Armed Dragon" which destroys a card and the effect of "Judgment Dragon" which sends cards from the Deck to the Graveyard, these effects cannot Special Summon a monster at resolution, so "Royal Oppression" cannot be chained to these effects. : Can the effect of "Royal Oppression" be chained to the effect of a Special Summon Monster? "Starlight Road" is activated directly in Chain to an effect which destroys two or more cards on the field. : Is "Starlight Road" activated directly in Chain to an effect which destroys? Suppose you control "Malefic Stardust Dragon" and a Field Spell Card. If your opponent activates an effect like that of "Demise, King of Armageddon" or "Final Destiny" or "Judgment Dragon" which would destroy "Malefic Stardust Dragon" and the Field Spell Card simultaneously, then the Field Spell Card is not destroyed since it cannot be destroyed by card effects. : Does "Judgment Dragon" destroy both "Malefic Stardust Dragon" and the Field Spell Card? A monster like "Dark Armed Dragon" or "Judgment Dragon" cannot be Special Summoned, except by the method stated in its text. It cannot be Special Summoned by effects like "Monster Reborn", even if it was properly Special Summoned beforehand. Also, you cannot Special Summon "Dark Armed Dragon" from the Graveyard even if there are exactly three DARK monsters in the Graveyard. 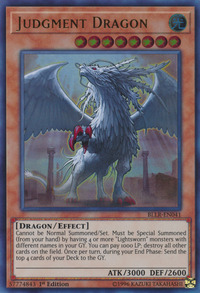 : Can monsters like "Dark Armed Dragon" and "Judgment Dragon" be Special Summoned from the Graveyard? "Book of Moon": Resolving backwards, since "Book of Moon" changes "Judgment Dragon" to face-down Defense Position, the effect of "Forbidden Chalice" is no longer applied, the effect of "Judgment Dragon" is not negated and the cards on the field are destroyed. "Interdimensional Matter Transporter": Resolving backwards, if "Interdimensional Matter Transporter" banishes "Judgment Dragon", its effect is negated. "Compulsory Evacuation Device": Resolving backwards, if "Compulsory Evacuation Device" returns "Judgment Dragon" to the hand, its effect is negated. : "Book of Moon", "Compulsory Evacuation Device" or "Interdimensional Matter Transporter" is activated, and "Forbidden Chalice" is activated in a Chain. When the effect of the targeted monster resolves, is that effect negated? If an effect is chained that flips "Judgment Dragon" face-down, it is not destroyed by its effect. See “Jain, Lightsworn Paladin” for additional rulings. Prime Material Dragon: When "Judgment Dragon's" effect to destroy all other cards on the field is activated, "Prime Material Dragon's" effect can be chained. Solemn Judgment: "Solemn Judgment" can negate the Special Summon of a monster that is Special Summoned through its own inherent Special Summon effect that does not start a Chain, like "Judgment Dragon" .